Sleepy Hollow, the new TV series on Fox, is pretty good. I watched the first 5 episodes in just one rainy weekend and they were exactly what I was looking for: a mix bag of modern crime mystery and thriller set against an end-times conspiracy story arc (that will span the season) and just the right amount of urban legend thrown in. 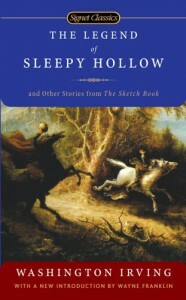 I was inspired to reread Irving's Sleepy Hollow after watching the show. Even though the two have very little in common--Ichabod Crane and urban legends--it's interesting to offset one against the other while comparing and contrasting tones and tropes.